From New Zealand to South Africa to Greece, my world travel guide is expanding. I still have a long way to go until I’ve reached the end of my “countries visited” list, but I don’t want it to end. I love traveling, and I feel fortunate enough that I can do it as part of my job while still having my family with me. Anyway, this blog entry will be about Oman, a little-known but powerful country in the Middle East. The country shares strategic borders with the United Arab Emirates, Saudi Arabia, and Yemen, which puts is an ideal trading location in the Persian Gulf. Although the country is in the Middle East, it’s ranked one of the safest and peaceful countries in the world. A souq, or a central marketplace, is a prime location for trading, buying and selling in Oman. Souqs have more than just clothes, jewelry, spices, antiques, and specially-made carpets for sale. They also have craft workshops where onlookers can learn the tricks of the trade, see daggers sculpted out of ivory or silver, and watch livestock on display before they’re auctioned off to the crowd. In Oman, souqs are a way of life. There are almost a dozen different markets to choose from! To get the full experience, shop in the cooler evening hours where most people will be out and about. Oman’s capital city of Muscat features an elaborate opera house with red and gold decor from Middle Eastern tradition. Built in 2011, the opera house is considered to be the premier venue for music and the arts, and they host events year round. Shows range from well-known titles like Giuseppe Verdi’s Aida and Pyotr Ilyich Tchaikovsky’s Swan Lake, to more cultural events like Ebtihalat and a celebration on Omani Women’s Day, which both feature local musicians singing in the native Arabic language. After a show, enjoy coffee and dessert at one of the many cafes in the area or enjoy a steak dinner at The Steak Company. Is your child hooked on watching television cartoons? 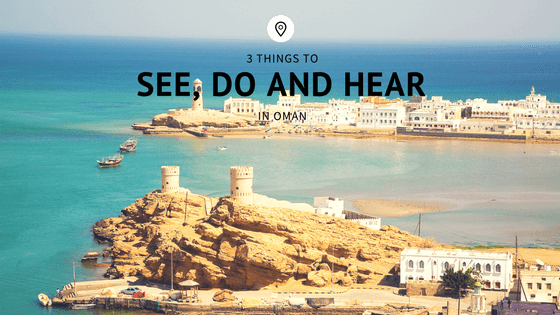 Take them to visit the Oman Children’s museum, which is right down the road from the Royal Opera House. Since the white-domed museum is for children, subjects will easily resonate with them by using cartoons and hands-on activities. With 45 exhibits, your children will get educated about science, technology, physics, and the ways of human life. Where in the world will I take you next? Stay tuned to my blog and subscribe below!